Darjeeling: From Gurudongmar Lake in North Sikkim to Chowrastha in Darjeeling and Tawang in Arunachal Pradesh, a new mountain pile of plastic is on the making. One of the largest clean up drive across 12 Himalayan states of the country conducted by 15,000 volunteers from more than 200 organisations on a single day on May 26 suggests that 95 per cent of the trash was of plastic. The Himalayan Cleanup was anchored by the Integrated Mountain Initiative (IMI) and Zero Waste Himalaya, which is a platform of organisations and individuals who are advocating sustainable waste management. "We organised a waste audit by collating information from 89 sites spread across 12 (Himalayan) states and our data suggest 97 per cent of the waste collected was plastic," said Roshan Rai, the member of the IMI. Multi-layered plastics that are used to pack food packs and other commodities accounted for 62.67 percent of the waste followed by single use plastic (plastic layered paper cup, plastic polystyrene utensils), PET bottles and tetra pack which is used for juice and milk. The team represented their findings before the ministry of environment and forest at Vigyan Bhavan in Delhi on June 1. Rai, who presented the findings along with his colleague Priyadarshinee Shrestha in Delhi, said: "We recommend a policy for mountain region so that single use plastics are stopped. There are examples of Sikkim government refraining from use of single use plastics during government functions. Such initiative can be taken up on an large scale," said Rai. The biggest challenge, however, is to phase out multi-layered plastic given that thing of daily use come packed in this layer. "There is no technology of recycling multi-layered plastics and this is why we appeal for extended responsibility from the producers," said Rai. The team also undertook a brand audit to identify the brands hoping that their findings would bring about more responsibility from the brands. The initiative has started bringing about some change. "Camelia School in Darjeeling has decided to stop serve non-packaged food in canteen and appeals are being made to various organisations in Darjeeling to stop using single use plastics. Similar appeals are also being made to GTA and hill municipalities to stop their use during their functions," said Rai. 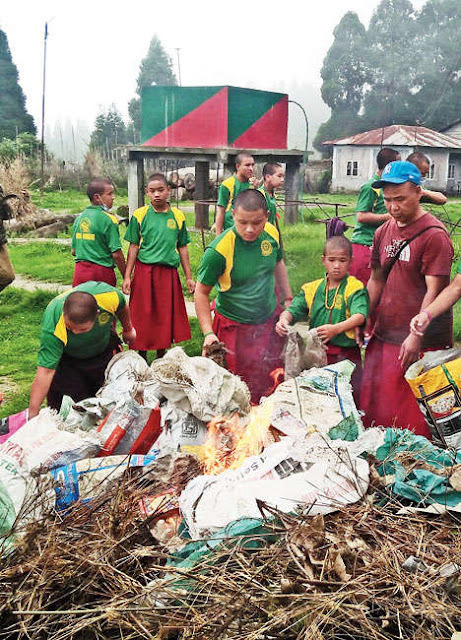 Sagar Tamang, vice-chairman, Darjeeling municipality said garbage vats would be removed from the town. "Darjeeling town will soon be garbage vat free town. Segregation of waste will be encouraged at the source (household point) and door-to-door collection of waste will be encouraged," said Tamang. From Gurudongmar Lake in North Sikkim to Chowrastha in Darjeeling and Tawang in Arunachal Pradesh, a new mountain pile of plastic is on the making.